The offering of food by Sujātā to Bodhisattva Siddhārtha is considered a turning point event in Siddhārtha’s journey towards his enlightenment. In his travelogues the Chinese monk- pilgrim Faxian (Fahien, 5th CE) - mentions a rock on which Bodhisattva Siddhārtha (the Buddha) sat, facing east, and ate the food offered by the village girl Sujātā. Recently, the Ratanāgiri rock, has been discovered 200mt east of village Bakrour in Bodhgayā with the indication of the rock site mentioned by Faxian. According to Faxian the rock was 2 Li (400mts-700mts) north of the place where Sujātā, the village girl offered rice-gruel (milk-rice) to Siddhārtha. The place of offering food by Sujātā was 2 Li north of where Siddhārtha went to bathe- in river Nairaňjaňa. And, the bathing place was 3 Li west of the spot where Siddhārtha took austerities (Beal 2005: 120-121). Presently, the Buddhist pilgrims visit Dharmāraṇya as the place of Siddhārtha’s austerities and Mātaṅgwāpī temple complex as the place where Sujātā offered food. The Ratanāgiri rock, as I discovered, is around 250 mts from Mātaṅgwāpī (refer map-1). The proposed identification of Rock site is of course correct only if the identification of Dharmāraṇya as the place of austerities and Mātaṅgwāpī temple complex as the place of food-offering are valid. Siddhārtha (the Buddha) spent six years in the vicinity of Mahābodhi Temple (Uruvelā); practiced several austerities, and subjected himself to severe self-mortification. He led a life of hardship, complete fasting, and starvation- so much so that his well-groomed body was reduced to a heap of bones and skin with all the flesh wasted away. After taking penance and austere practice for around six years, he felt that he was pursuing a wrong path. he became convinced that he would not get enlightenment and final liberation through a weak body that had lost its strength. He decided to shun the austere life and go to nearby villages to beg food and strengthen his body again. On the day of Veśāk Pūrṇimā (full-moon day of May), a village girl by name of Sujātā is said to have served him with milk-rice, thereby ending the six-year period of his severe fasting. The same evening Siddhārtha practiced under the Pipala tree (Ficus religiosa) and attained enlightenment and became the Buddha. According to ancient literatures the place where Siddhārtha took austerities and place of his enlightenment were in same vicinity in Uruvelā (now Bodhgayā). 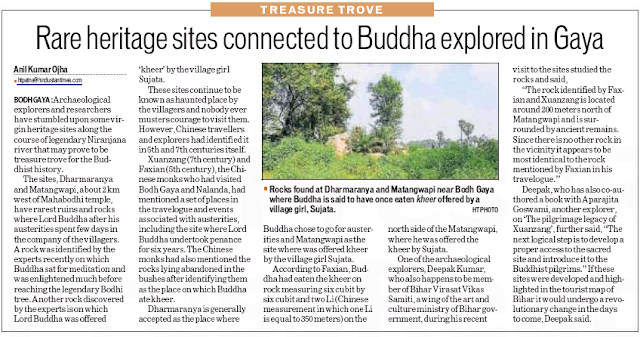 I think I should explain why we are talking about identification of places associated with the Buddha. I assume, my readers are aware of the fact that in 6th BCE, Siddhārtha (the Buddha) spent six years in this vicinity of Bodhgayā (Uruvelā in ancient times) practicing different forms of meditation before finally attaining enlightenment under the Bodhi Tree. Buddhism and Buddhist pilgrimage flourished in Indian subcontinent till change of political climate in 11th CE, when Buddhism and Buddhist pilgrimage gradually declined and eventually stopped. In the next few centuries, the neglected tangible remains of the Buddhist cultural movement like Chaitya-s (temple) and Vihāra-s (monasteries) transformed into earthen mounds. All the oral and written traditions of the Buddha got corrupted or lost in its land of origin. The British colonizers of India in 17th and 18th CE could not make much of the ancient caves, stone sculptures, earthen mounds that were strewn across the Indian subcontinent. These ancient remains were thought to be of foreign origin. The history of the origin of Buddhism in India remained unknown to the world until the beginning of the 19th century when the translation of Mahāvaṃsa, a historical chronology of development of Buddhism in Sri Lanka by George Tournour and the translation of two sets of Kanjur by Brian Hodgson helped in tracing the origin of Buddhism to India. Travelogues of Chinese monks Faxian and Xuanzang (Hieun Hsang, 7th CE) played a very important role in the identification of the places associated with the life of the Buddha in Indian subcontinent. Identification of Buddhist places mentioned in ancient Buddhist literatures that started in 19th CE still continues. Abhinishkramana Sūtra, Lalitavistara, Mahāvastu (Jones 1952:119,191) and Buddhacharita (Willemen 2009: 89) maintain that Siddhārtha first went to Gayāsirśa hill (Brahmayoni, Gayā) before finally arriving at the place where he took austere practices for next six years. Nidānkathā doesn’t mention anything about Siddhārtha going to Gayāsirśa. According to it, Siddhārtha reached Uruvelā after practicing briefly under Uddaka Ramputra (Childers, Davids & Davids 1925: 181). According to Abhinishkramana Sūtra Uruvilvā was on the southern side of Gayā town. According to Mahāvastu, Uruvelā was region consisting of villages Praskandaka, Balākalpa, Ujjangala, Jangala and village of Senāpati,(Jones 1952: 197). According to Pāli sources, the place of penance was village Senānigāma in Uruvelā. Mahāvastu and Lailtavistara also says the place of austerities was village of Senāpati in Uruvelā. According to Lalitavistara the place of austerities was thick forest full of herbs. it was situated east of Uruvilvā near Nairāñjanā river. Except for the Buddhacharita, all the literatures says that the place of austerities was Uruvelā but Buddhacharita is silent about Uruvelā (Uruvilvā). Instead, it says, Siddharthā after leaving Uddaka Ramaputra reached forest of asceticism called Nagarī (Willemen 2009:89). All this literature says that the place of austerities was by the banks of river Nairāñjanā (Nerañjarā) (Jones 1952: 224; Willemen 2009:89). According to Abhinishkramana Sūtra, the place of austerities was eaast of village Uruvilvā, besides the bank of river Nairāñjanā (Beal 1875: 190). According to Faxian, the place of austerities was 20 Li south of Gaya city and half Yojan south-west of shadow cave (Dungeswari hill) (Beal 2005: Ch xxxi). According to Xuanzang, the places associated with austerities were in a forest East of Muchalinda Tank. The 13th CE Tibetan monk Dharmaswāmin has mentioned the place of austerities was two arrow shots from the bank of river Nairāñjanā (Reorich 1959:81). Biographical texts and Xuanzang's accounts have mentioned the village of Sujātā, the place of austerity and the place of enlightenment are by river Nairāñjanā. But, none of these texts have explicitly mentioned them to be on the opposite banks of Nairāñjanā as they are popular now. Presently, Dharmāraṇya is accepted among the Buddhist pilgrims as the place where the Bodhisattava Siddhārtha took austerities for Six years. 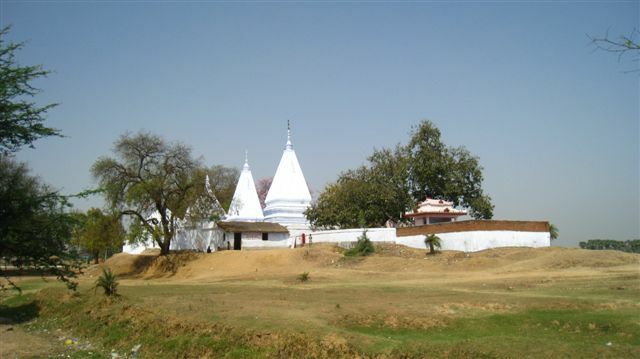 Similarly, Sujātā stūpa in village Bakrour is worshiped by the pilgrims as the place where the village girl Sujātā lived, and a banyan tree in Mātaṅgwāpī temple complex as the place where Sujātā offered food to Siddhārtha. Mātaṅgwāpī, Dharmāraṇya and Sujātā Stūpa, the places associated with the austerities are on the east bank of river Nairāñjanā. And, Mahābodhi, the place where Siddhārtha attained enlightenment is on the west bank of Nairāñjanā. Faxian's description do suggest that the places associated with the austerities was geographically a little separated from the place where the Buddha attained enlightenment. But, unfortunately, Faxian is silent about river Nairāñjanā. Therefore, Faxian's description too, do not inform us how these two set of places are actually located with respect to river Nairāñjanā. The 13th CE Tibetan monk Dharmaswāmin has mentioned the place of austerities to be two arrow shots from the bank of river Nairāñjanā. But he doesn’t mention exactly which bank- eastern or western, or the direction of shooting the arrow. Though, in the preceding lines, just before where Dharmaswāmin mentions the austerities place, he mentions, how one may cross river Nairāñjanā and reach on the other side of Nairāñjanā river (from Mahābodhi Temple) (Reorich 1959:81). This description, therefore seems to allude to places of austerities being on the eastern bank of river Nairāñjanā i.e. opposite to Mahābodhi temple. But, since Dharmaswāmin is generally inconsistent about distance and direction of places, his accounts are generally not considered earnestly for identification of places. We also find a reference in the Second Avalokita-Sūtra of Mahāvastu, about the Bodhisattva Siddhārtha crossing the river Nairāñjanā after the episode of receiving food from Sujātā (Jones 1952: 283). But this being a sole reference, doesn’t elicit confidence. In the light of the facts above- we should examine, if the identifications of the Mātaṅgwāpī, Dharmāraṇya and Sujātā stūpa are indeed accurate. A big ancient mound on the north-east corner of Bakrour village was excavated by Patna Circle, Archaeological Survey of India (ASI) in 1973. 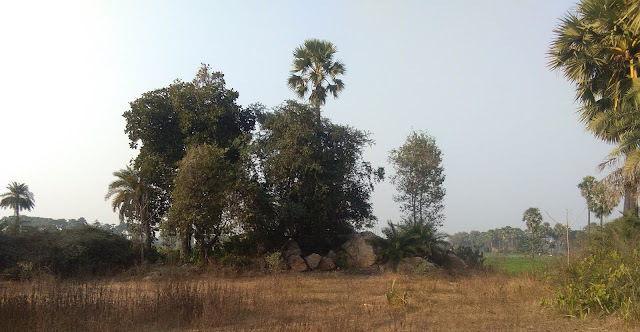 The reason for excavation being, the mound was locally called Sujātāgaḍha, Sujātākuti, Sujātā Quilā (IAR, 1974), Suggesting this mound was linked to Sujātā, the village girl who had offered food to Siddhārtha after he ended his six years of penance. Excavation by Shri K N Srivastava led to discovery of many seals from 8th-9th CE reading Sujātāgriha (house of Sujātā) (Sinha 2000: 5). The excavation revealed that stūpa was built in three phases first phase in 2nd BCE and last phase was 8th-10th CE. Was there any oral tradition of ‘Sujātāgaḍh’ which became the basis of 1974 Excavations, linking the mound in question to the village girl Sujātā? Reason for the reluctance to accept this is, none of the 19th CE explorers, Francis Buchanan (1811), Markham Kittoe (1847), Alexander Cunningham (1861) and Auriel Stein (1901) who surveyed Bakrour have reported existence of any mound ‘Sujātāgaḍh’ or any local tradition regarding Sujātā in village Bakrour. Mahant (chief priest) of Bodhgayā maṭha (Mahant compound, Bodhgayā), who was accompanying F. Buchanan during his survey in 1811 informed him that Bakrour was the place where the Buddha took penance. According to Mahant, one of the Buddha’s associates during his penance period, when he died, was buried in the mound (Buchanan 1925:55). Buchanan informs the mound was called ‘Koteni’. Cunningham, Kittoe and Stein have not reported anything about this story of austerity of the Buddha (Siddhārtha) and mound being the burial spot of the Buddha’s companion. Cunningham however mentions that the mound was called ‘katani’ and that Bakrour was earlier called Ajaypura. I interviewed few elderly people in village Bakrour and enquired about the ancient mound in question (i.e. Sujātāgaḍh). All the villagers had one answer, ‘we know the mound as Sujātāgaḍh since our childhood’. In 1950’s and 60’s, village elders recall, many pilgrims, especially from Tibet and Burma (Myanmar) coming to worship the Sujātāgaḍh. I asked this question to Shri Goswami Deendayalu Giri, caretaker of Bodhgayā maṭha. He joined Bodhgayā maṭha in 1944 as a novice. He is now 95 year old. Shri Giri is respected in Bodhgayā for his knowledge and awareness about local places and their traditions. Shri Giri confirmed what villagers had said. Katani/Koteni, the name documented by Buchanan and Cunningham in 19th CE is still in use by the villagers. Though, not for the mound as mentioned by both the explorers but for the immediate surroundings of the mound. The mound according to villagers was always called Sujātāgaḍh (now Sujātā stūpa). Katani in local language means harvesting. Sujātāgaḍh is situated between community lands (public land). The villagers have traditionally been using this public land to collect and process the harvested rice and wheat crop, therefore, they call it Katani. Dharmāraṇya is approximately 1 km east of village Bakrour. It is situated on the western banks of river Mohāne. It is interesting to know, that unlike Bakrour mound, which has a local tradition linking the ancient mound with Sujātā, Dharmāraṇya and Mātaṅgwāpī has no such Buddhist association in the village folklore. According to the ancient Hindu literature Vāyu Purāṇa, the Bo-tree Aśvattha (Bodhi tree), Dharmāraṇya and Mātaṅgwāpī are part of the Gayā śrāddha (funeral rites) pilgrimage. 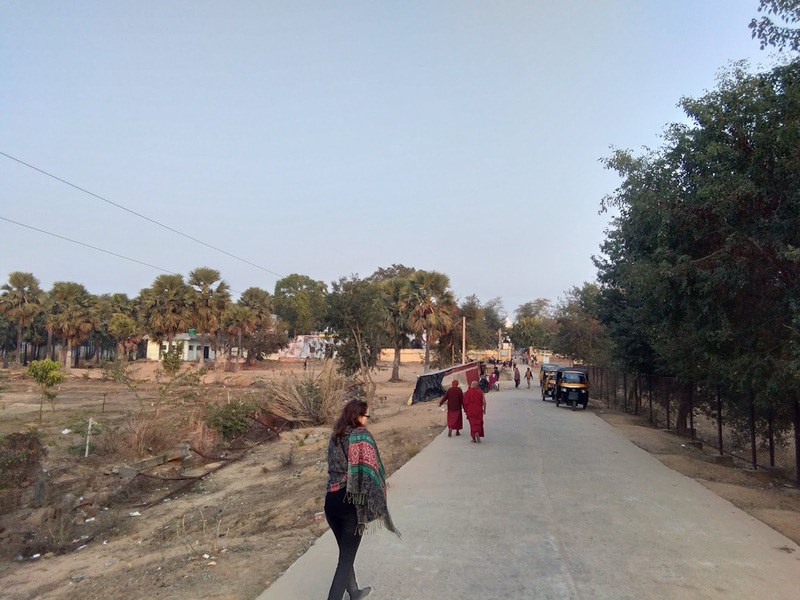 These three places in Uruvelā are part of the 45 sites in Gayā-kshetra (holy tract of Gayā) where the Hindu pilgrims from all over the India come to offer Pindas (balls of rice) to the spirits of the dead ancestors (Barua 1934:16). According to Vāyu Purāṇa, Dharmeśwara or lord of Righteousness is a form of the Buddha worshipped in Dharmāraṇya (Barua 1934: 21). Thousands of Hindu pilgrims from all over the India visit Dharmāraṇya and Mātaṅgwāpī every year to offer prayers and perform rituals for their ancestors. Hindu priests, caretakers of Dharmāraṇya temple have a story similar to the one of Sujātāgaḍh about Buddhist pilgrims since 1950’s visiting the Dharmāraṇya. According to the local priests, the Buddhist pilgrims visiting Dharmāraṇya believe that the Siddhārtha took six-year austerities at this place. His Holiness the 14th Dalai Lama in his visit to Bodhgayā in December 1956 also visited and offered prayers at Dharmāraṇya. 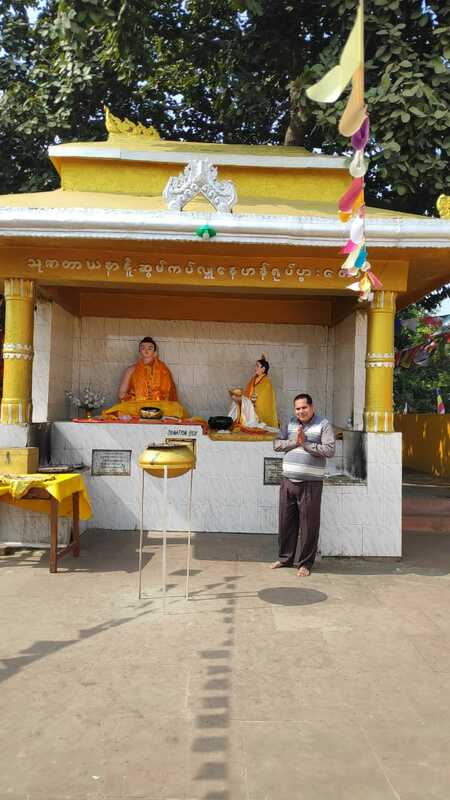 Shri Ram Nath Pandey, an elderly priest at Dharmāraṇya, who was present on the occasion, heard His Holiness saying that he has come to offer prayers at Dharmāraṇya for the Buddha took penance here. Mātaṅgwāpī temple complex is situated between village Bakrour and Dharmāraṇya. At the east end of Mātaṅgwāpī temple there is an old banyan tree (Ficus benghalensis). According to the local priest Shri Pramod Mishra, the banyan tree is object of worship for the Buddhist pilgrims who according to him have been visiting the place since 1950’s. According to the Buddhist tradition, a remarkable banyan tree standing in the village of Senānigāma and not far from the bank of the Nairāñjanā was believed by the local people to have been an abode of a benevolent spirit, the presiding deity of the village. Sujātā is said to have made a prayer to the tree spirit expressing this solemn vow that if the deity were pleased to grant her two wishes, one for being married into a family of equal social status and the other for obtaining a son for her first born child, she would honour the deity with religions offerings. On the fulfilment of these wishes, she offered Bodhisattva Siddhārtha Kheer (delicious milk-rice) all the while thinking that he was the tree spirit who had granted her wish. According to Shri Mishra, the existing banyan tree in Mātaṅgwāpī is the same spot not necessarily the same tree where Sujātā made offering to Siddhārtha. According to Shri Mishra, the tradition of religious offering to banyan tree continued at this spot. According to Mishra ji, one can still see girls who have attained marriageable age and the married women in village Bakrour, on different occasions in year worship and make religious offering to this banyan tree. To facilitate the Buddhist pilgrims, Shri Baleshwar Pathak ji, in 1950’s, made a small temple near the sacred Banyan tree. The temple is called Sujātā Kheer offering temple. 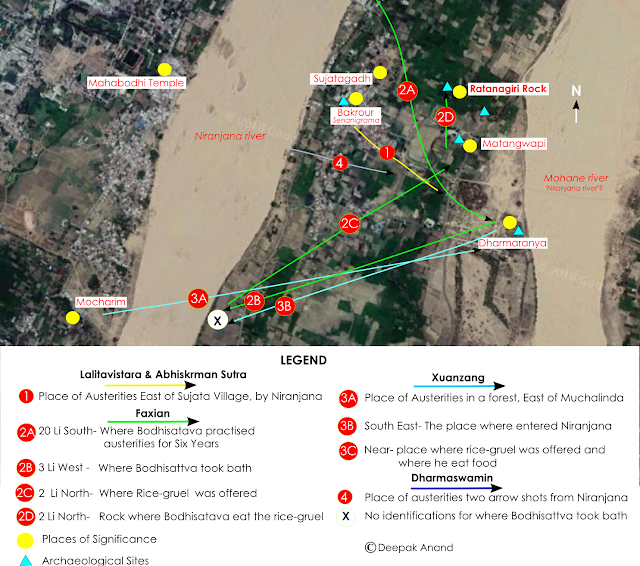 This discovery of many medieval period terracotta sealing reading ‘Sujātāgṛiha’ establishes that present day village Bakrour is either a continuation of village Senānigāma (Uruvelā) or is settled over the ancient remains of Senānigāma. We may plot the references of places of austerities given in the biographical literatures and travelogues with reference to village Senānigāma (Bakrour). This corroboration will allow us to examine if the present identifications of Dharmāraṇya and banyan tree (Matanwāpī temple) fits/is anywhere close to the textual descriptions of locations of place of austerities and place where Sujātā offered food. A. It is now believed that present identification of Muchalinda tank within the Māhābodhi Temple premises is incorrect. 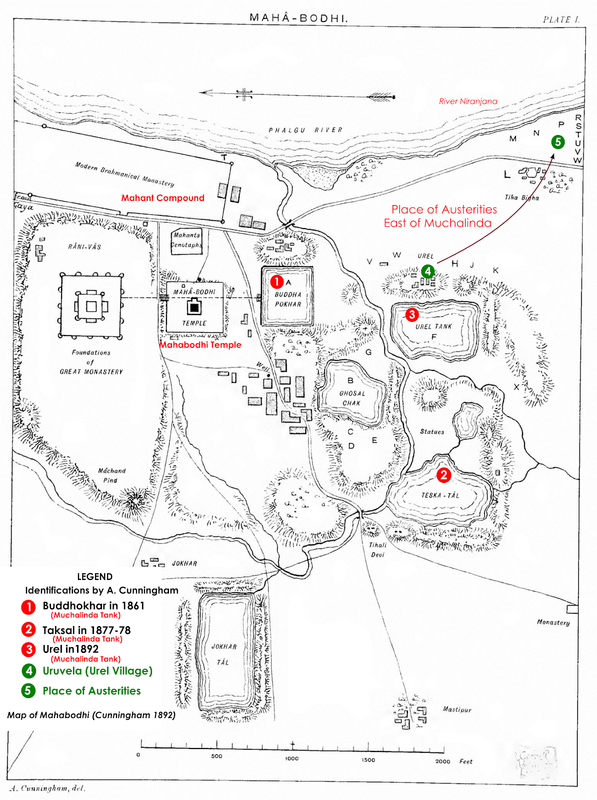 Studies suggest the village Mochārim on the south side of Māhābodhi Temple could be the corrupt form of Muchalinda (tank of Muchalinda nāga). 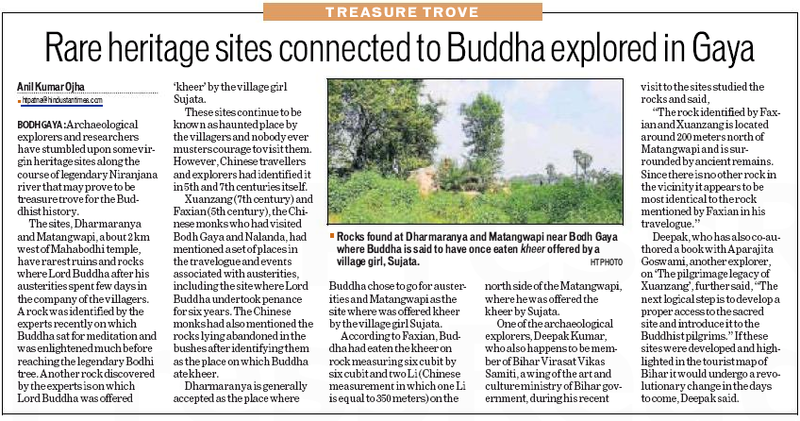 There is a strong circumstantial evidence to support this because Xuanzang has mentioned the tank of Muchalinda nāga to be on the south side of Māhābodhi Temple and the present-day village of Mochārim has a water tank among other ancient remains. B. Nairāñjanā and Mohāne are the two river beds flowing on the west and east side of village Bakrour (Senānigāma, Uruvelā). But the biographical texts have mentioned only one river Nairāñjanā in context of Uruvelā of Uruvelā/ Senānigāma. Descriptions in the Biographical texts implies, Senānigāma should be on the west bank of Nairāñjanā. This is in contravention with archaeological and inscriptional evidences that have established the Bodhi tree on the western and Senānigāma on the east sides of Nairāñjanā. The description in biographical texts would make sense if we assume that these texts for some unexplained reasons have used single name, Nairāñjanā, for both the rivers i.e. Nairāñjanā and Mohāne flowing on west and east side of Bakrour. 1. According to Lalitavistara and Abhinishkramana Sūtra, the place of austerities was east of village of Sujātā, by the bank of river Nairaňjaňa. The place of austerities was 20 Li South of Gayā city and half yojan south-west of shadow cave (Dungeshwari hill). 3 Li West from the place of austerities was the place where he entered river to bathe. 2 Li North is the place where the girls presented rice-gruel to Siddhārtha. 2 Li North is the rock (6 cubit in length and breadth and 2 cubit in height) where he sat facing east under great tree and ate food. The places associated with austerities were in a forest East of Muchalinda Tank. The place where Siddhārtha entered Nairāñjanā was south-west to place of austerities. Place where the food was offered was near. The place of austerities was two arrow shots from the bank of river Nairāñjanā. 1. Dharmāraṇya and Mātaṅgwāpī are among the 45 places under Gaya śrāddha (funeral rites) pilgrimage for Hindus. Vāyu Purāṇa, an ancient brahmanical text, associates these two places and the Bodhi tree as place of the Buddha (Dharmeśvara or lord of Righteousness). Most likely, in ancient times Dharmāraṇya and Mātaṅgwāpī were very significant Buddhist pilgrimage places. Like the Bodhi tree, Dharmāraṇya and Mātaṅgwāpī were also absorbed into Hindu pilgrimage (Gayā śrāddha) after Buddhism came to its ebb at some point in 2nd millennia. Buddhist connection of these places has also been alluded to by F. Buchanan and A. Cunningham. Mātaṅgwāpī was the property of Gayā maṭha. About hundred years ago, Mātaṅgwāpī was handed over to the Brahmins of village Bakrour who are now caretakers of this temple. 2. According to Lalitavistara and Abhinishkramana Sūtra, the place of austerities should be between village of Sujātā (Bakrour) and river flowing to its east (mohāne). Dharmāraṇya and Mātaṅgwāpī temple complex are the most prominent archaeological mounds that fits this description. 3. According to Faxian, the place where the Buddha took bath in river Nirañjanā was 3 Li west (approximately 1 km) of the austerities place (Beal 2005: Ch xxxi). According to Xuanzang, the place where Siddhārtha took austerities was in the east of Muchilinda tank in the wild (forest) (Beal 1969). Xuanzang mentions that the place where Siddhārtha entered river Nirañjanā was southwest of the austerities place. These distances and directions mentioned by both Faxian and Xuanzang can be correct only if the events associated with the austerities were on the east bank of river Nairāñjanā as depicted in the map (see figure 2). Dharmāraṇya is the most appropriate location that best meets the description. 4. According to Faxian, the spot of the food-offering should be north of the austerities place. And, the rock where Siddhārtha ate the food was north of the food-offering place. 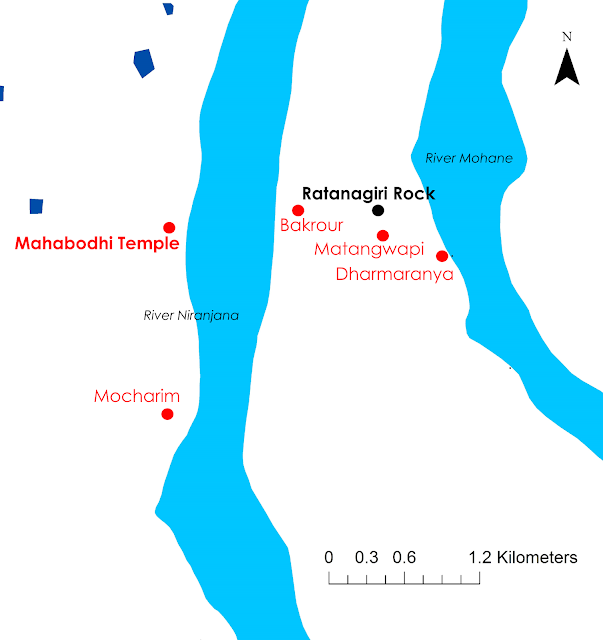 We can see, Mātaṅgwāpī temple complex is north of Dharmāraṇya and the Ratanāgiri rock is north of Mātaṅgwāpī. The three places are also within the approximate distance range –assuming a little flexibility mentioned by Faxian. 5. Ratnāgiri rock is approximately 12ft square and around 6ft high. Samuel Beal mentions the Stone to be 6ft square, and 2ft in height (Beal 2005: 121). According to James Legge, the Rock may be six cubits in breadth and length and rather more than two cubits in height (Legge 1886). Legge's description translates into 9ft X 9Ft X 3ft (1 Cubit=1.5ft. Source: Wikipedia). We have noticed little difference between Beal's and Legge's interpretation about the size of the rock mentioned by Faxian. Though, there is a perspicuous mismatch between the dimensions mentioned in the translations of Faxian and the size of the Ratanāgiri rock. But, the translations are inconsistent about the dimensions of the rock/stone. The inconsistency in translations should allow us to be a little flexible about the size of the rock. What is crucial and overriding is that Ratanāgiri is the only rock in this vicinity, and consequentially, it fulfills the distance and direction mentioned by Faxian. In light of this discussion, it is safe to conclude that Ratanāgiri rock should be the rock where Siddhārtha ate the food offered by Sujātā as mentioned by Faxian. 6. What remains unresolved is, what events led to Dharmāraṇya and Mātaṅgwāpī becoming popular among the Buddhist pilgrims in 1940's and 1950's. This is important because, unlike Bakrour, that had a local tradition of Sujātāgaḍh, these two places have no such reference. The projection proposed here are also only conjectures based on circumstantial evidence that fits the literary descriptions, Sujātāgaḍh excavation, oral tradition and archaeological remains. 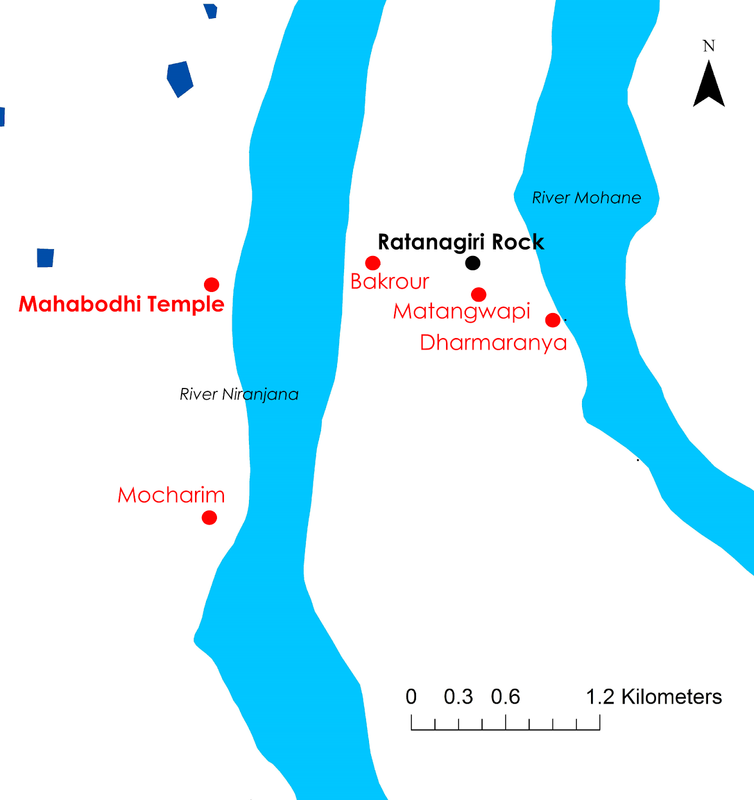 There are some very prominent archaeological mounds little northeast of Mātaṅgwāpī temple complex and south east of Ratanāgiri rock. This mound may have some association with the episode of food offering by Sujātā. All the archaeological sites in the vicinity needs to be scientifically explored and excavated to reveal the complete truth. Sir Alexander Cunningham was the first scholar who proposed the tentative locations of sacred places in Bodhgayā. Cunningham's identification, however, were basically guesses; he could not support his identifications with archaeological or inscriptional evidence. Cunningham's identifications were based on Xuanzang's works. Because Xuanzang explained locations of the places near Māhābodhi relatively using phrases like 'near that', 'by the side of', 'not far from', Cunningham was led to believe that all the places were located within a very small area around the Māhābodhi Temple (see map 3). According to Xuanzang places of austerities were in a dense forest, east of Muchalinda Tank. like many of his identifications, Cunningham was not consistent with identification of Muchalinda tank (see map 3). In his first report of his visit to Bodhgayā in 1861, he proposed Buddhokhar tank being the Muchalinda tank. In his report of 1877-78, he proposed Taksal Tāl (Teska) to be the site of Muchalinda tank. In his book Mahābodhi, published in 1892, he has proposed Urel tank as the site of Muchalinda tank. Accordingly, Cunningham proposed a small hamlet Urel, to the south east of Mahābodhi temple as Uruvelā, the village of Sujātā and place where Siddhārtha took austerities. Faxian, unlike Xuanzang, has not used phrases like ‘nearby’, ‘not far from’ etc., instead he has given distances for places of austerities in Li. But, Cunningham didn’t take Faxian seriously, according to Cunningham his notices are of no use for the purpose of identification (Cunningham 1875-76; 1877-78: 147). Faxian has mentioned a Rock on which Siddhārtha took seat and ate the food offered by Sujātā. Cunningham identified a circular stone, 5ft 7.5 in diameter and 2ft high, in a small temple of Vageswari devi on the east side of Mahābodhi temple with the Rock mentioned by Faxian(Cunningham 1871: 7). However, Cunningham didn’t explain that Rock mentioned by Faxian was not fitting the description of the location provided by Faxian. If Cunningham would have also taken into account Faxian’s descriptions, he would have noticed that unlike Xuanzang who has proposed places of austerities with reference to Mahābodhi Temple, Faxian’s description of places of austerities was with reference to Gayā town and Prāgbodhi hill. Which implies that they were different locations. Also, according to Faxian the places of austerities were spread out in a large area and not within a small area as Cunningham has proposed based on Xuanzang. Thanks to Shri Prahlad Ji (village Bakrour), for his help in discovery of this rock. I sincerely appreciate Priya Malhotra, Jackie Vishwakarma and Rajiv Kumar for their invaluable help in publication of this story. Barua, B. M.; 1934, Gaya and Bodhgaya, Calcutta. Beal, Samuel. ; 2005, Travels of Fah-hian and Sung-Yun, Buddhist Pilgrims from China to India, Low Price Publications, Delhi: (Originally published London: Trubner and Co.: 1869). Co. Ltd, London. (New Edition 1911). ---------------. 1969, Si-yu-ki: Buddhist records of the Western World, Translated from the Chinese Of Hiuen Tsiang, Oriental Books Reprint Corporation,Delhi, (1st Pub. 1884. London: Trubner & Co.). ………….. 1875, The romantic legend of Sâkya Buddha: from the Chinese-Sanscrit, A translation of the Chinese version of the 'Abhinishkramana sûtra', done into that language by Djnanakuta. London: Trübner & Co.
Buchanan, Francis; 1925, Journal of Francis Buchanan, Patna and Gaya, Edited with Notes and Introduction by V.H. Jackson, Published by Superintendent, Government Printing, Bihar and Orissa. Cunningham, A.1892. Mahabodhi or the Great Buddhist Temple under the Bodhi Tree at Buddha-Gaya. London: W.H. Allen. Cunningham, A.; 2000, Archaeological Survey of India Four Reports Made During the Years 1862-63-64-65, Vol-I, Published by ASI, GOI, 2000, (First Published in 1871). ----------------; 2000, Archaeological Survey of India Report of Tours in Gangetic Provinces from Badaon to Bihar in 1875-76 and 1877-78, Vol-XI, Published by ASI, GOI, 2000, (First Published in 1880). Childers, R. Caesar., Davids, C. A. F. Rhys (Caroline Augusta Foley Rhys)., Davids, T. W. Rhys (Thomas William Rhys). ; 1925. Buddhist birth-stories (Jataka tales): the commentarial introduction entitled Nidāna-kathā, The story of the lineage. New and rev. ed. London: G. Routledge. Goswami, A., Anand, D.; 2016, The Pilgrimage Legacy of Xuanzang, Nalanda: Nava Nalanda Mahavihara (Deemed University). Jones, J.J. (trans. ); 1952, The Mahāvastu Vol.II, London: Luzac & Co.
Stein, M. A.; 1901, “Notes on an Archaeological Tour in South Bihar and Hazaribagh”. Indian Antiquary. Vol. 30. Edited by Richard Carnac Temple. Bombay: Education Society’s Press. Sinha, B. P.; 2000, Directory of Bihar Archaeology, Silver Jubilee Year Publication. Patna: Bihar Puravid Parishad. IAR: Indian Archaeology 1973-74: A Review. New Delhi: Annual publication of Archaeological survey of India. Kittoe, M.; 1847, Notes on the Viharas and Chaityas of Behar, Journal of Asiatic Society of Bengal, Vol-XVI, Part-I, (Edited By-The Secretaries), Printed by J. Thomas, Baptist Mission Press, Calcutta. Patil, D. R.; 2006, The Antiquarian Remains in Bihar, K. P. Jayaswal Research Institute, Patna, (1st Edition: 1963). (Chag lo tsa-ba Chos-rje-dpal), Published on behalf of Kashi Prasad Jaysawal Research Institute, Patna by Shantilal Jain, Shri Jainendra Press, Jawaharnagar, Delhi, K.P Jayaswal Research Institute. by Royal Asiatic Society, London, 1904-05). Willemen, Charles; 2009, Buddhacarita: in praise of Buddha's acts: (Taishō volume 4, number 192) by Aśvaghoṣa. Berkeley, CA: Numata Center for Buddhist Translation and Research. VII. Where did Mahāpajāpatī Gotami attained nirvāṇa? Words written and pictures shared cannot be reproduced without the permission of the blog owners. Simple theme. Powered by Blogger.